When you begin researching information about different fats and their role in your diet, you will find quite a bit of conflicting information. However, almost everyone can agree that olive oil – especially extra virgin olive oil – is a substance that is actually good for you. 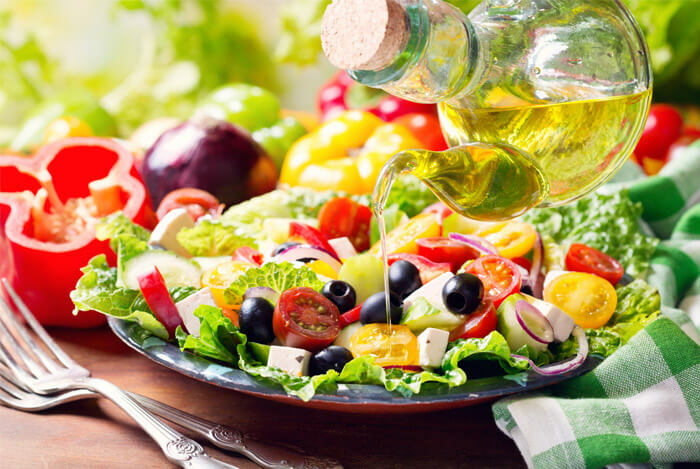 Everything in moderation is ideal, but olive oil provides the body with essential nutrients. That’s great news because that means you can drizzle it on your salad and use it to fry your chicken, without the guilt. Make sure to not overdo it! Extra virgin olive oil is a favourite for many recipes because it is a nutritious ingredient. In addition to being a good fatty acid, it is also full of modest amounts of both vitamins K and E. However, what is even better is that olive oil is full of antioxidants. These antioxidants are able to help fight off serious diseases and cases of inflammation. Antioxidants also help to prevent the cholesterol present in your blood from getting oxidized, which in turn helps prevent heart disease. Drizzle away! A plethora of frontier studies indicate that a leading driver of a number of diseases is chronic inflammation. This includes serious diseases, such as Alzheimer’s, obesity, arthritis, diabetes, cancer, metabolic syndrome and even cardiovascular disease. Olive oil has been proven to help reduce cases of inflammation. In fact, there are some studies that show that the antioxidants in olive oil can inhibit some of the proteins and genes that cause inflammation, begin with. The most common cause of death in the world is heart disease. However, it is a rare occurrence in the Mediterranean Sea region. When interest in this peaked, people began extensively researching this diet. What they found was that the key ingredient of the Mediterranean diet is extra virgin olive oil. When consumed, it helps lower your blood pressure and protects against oxidation of LDL particles, which helps prevent heart disease. This is considered the most common neurodegenerative disease in the entire world. A key feature of this disorder is the accumulation of beta-amyloid plaque in brain cells. In mice, a study has shown that olive oil helps to remove this plaque from brain cells. While this is not scientifically confirmed, it is believed that olive oil may help to prevent Alzheimer’s. This condition is characterized by painful and deformed joints. According to research, olive oil may help inflammatory markers while reducing the oxidative stress in those suffering from this condition. It has shown to be especially beneficial when it is combined with fish oil. Here at Fernandos Italian we take pride in adding olive oil in our recipes and have been astonishing clients with amazing dishes that balance both taste and nutrition. When the phrase “best restaurant Sydney” or “best function rooms restaurant” are mentioned, you know that we will come to mind. With an array of Mediterranean and Italian dishes our reputation is unparallel and we continuously aim to improve. Contact us today for a taste!